Includes over 200 double-sided, magnetic word tiles. 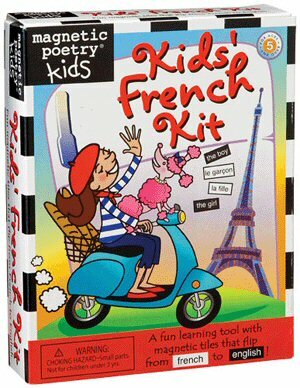 Created with the help of native speakers, the Kids' French Kit features word tiles that are printed on two sides and stick both ways, with a French word on one side and its English translation on the other. Basic vocabulary builder, but good for adults who want to learn too! Tile height is 1cm. Package size is 15cm (L) x 12cm (W) x 3cm (H). For ages 5 and up. Magnetic Poetry can be considered a true pop culture phenomenon. Today, the Magnetic Poetry product line contains more than 90 titles, including these shown here, which are particulary useful for people learning French, Spanish, Italian, German or English. Studies have proven that playing with these sets is helping students to learn words, structures and spelling in their chosen foreign languages. Each kit comes with over 450 individual words printed onto small fridge magnets, enabling you to create sentences. Can be used on the fridge door, on a filing cabinate, on a tray on your lap - in fact on any metal surface. So why not buy a kit and bring some additional fun to your language learning. Usually sent to UK mainland addresses on a next-day service. Delivery overseas can take a few days longer. We generally dispatch sameday if you order before 12 noon. When you input your address details, you can also add special delivery instructions.